Welcome to the Seabreeze House, a five-bedroom house divided into two separate living quarters. Enjoy the views of Stonington Harbor from this in-town home. 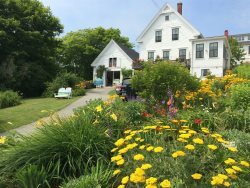 The Seabreeze House is conveniently located on North Seabreeze Avenue and is just steps from the village of Stonington and The Isle Au Haut Boat Company. The Bow is a three-bedroom, one and a half bath apartment. Enjoy a full kitchen with a dining area that accommodates six people. The living room has a comfortable couch, chair and cable television. There is a door in the living room that leads out to the front yard where you can harbor watch while basking in the Adirondack chairs that overlook that Stonington Harbor. The first floor of The Bow also has a half bath and an entry way with a washer and dryer. The second floor of The Bow has three bedrooms and a bathroom with a tub. The master bedroom has a queen bed, a large closet, and a desk area. The master bedroom also has a full row of windows for beautiful water views. The second bedroom has a full bed, a closet, and a dresser. The third bedroom has two twin beds and a dresser. Enjoy being in the midst of the town's happenings, while also enjoying comfortable, clean furnishings. The Bow is the perfect spot to bring the family for a real Maine adventure.